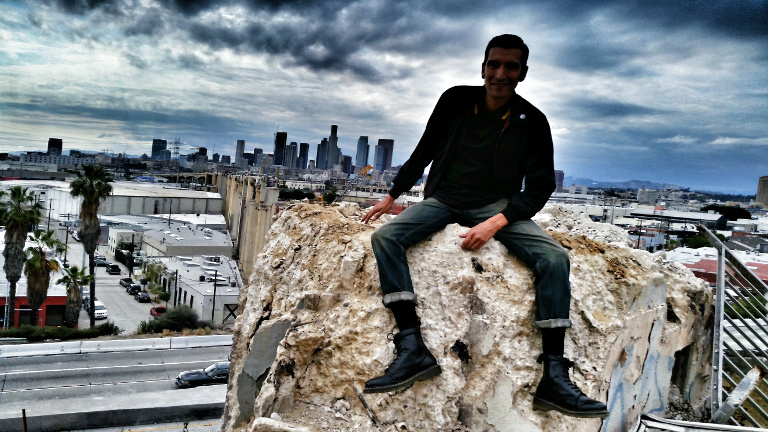 Sitting on one of the broken stumps of the art deco pillars that once graced the eastern end of the classic Sixth Street Bridge. 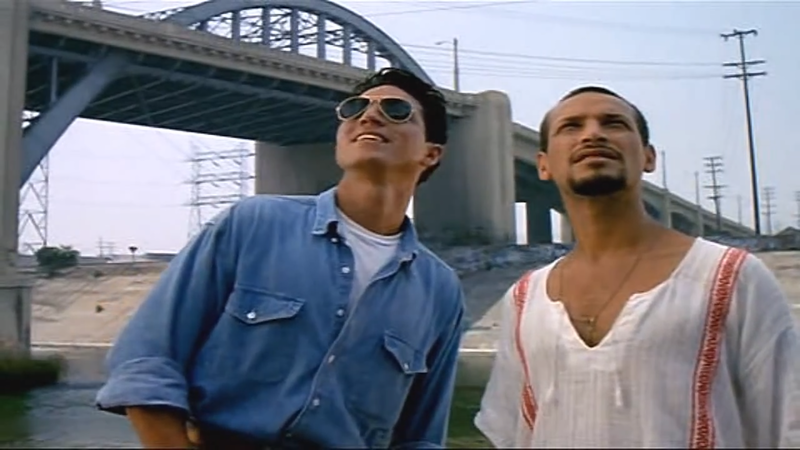 At the eastern entrance of the classic Sixth Street Bridge there used to be two huge monoliths standing mightily like sentries at the gates of the city, at the point where the expanse of the bridge began its extension from the bluffs of Boyle Heights and jetting towards downtown Los Angeles. These two matching pillars which stood there, they were part of ornamental walkways built into the structure. They were key elements of the art deco-streamline modernist style of the bridge. Wrapping around the sides of both of these pillars were long abandoned stairways which once lead to the both industrial and residential areas on the eastern bank of the river known as the Boyle Heights Flats. Eventually these public stairways would be closed when the first primitive highway routes pushed through here decades ago. And eventually these artistic features of the bridge would come to sit in the middle of the East Los Angeles Interchange, an intertwining network of freeways which would be built through our neighborhood two generations ago. Which means they were visible to bridge traffic, and also to the freeway traffic which ran past and through the bridge. For us eastside kids these monoliths had always greeted our comings and goings. I have always looked out with great anticipation for these landmarks to welcome me home as we passed. So I’m very pained to see them gone. 1932 – The newly constructed classic Sixth Street Viadcut, and her pillars. During the first two days of the demolition of the original Sixth Street Bridge it would be these areas of the viaduct that would meet it’s final fate. 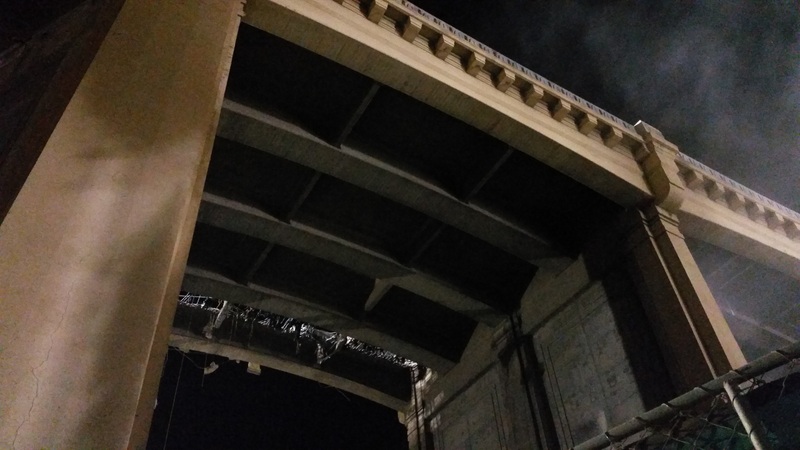 The part of the bridge which jetted over the freeways would be completely demolished. And it was these artistic elements at the head of the bridge which would be smashed to pieces during those first days. Leaving an almost apocalyptic landscape just to the side of these freeways. In the evenings I often find myself making my way towards this spot. Staring out towards the horizon during sunset. Captivated by the beauty of the downtown skyline, as it rises over a foreground of broken concrete and terrible destruction. In the evening I often see local young people and photographers coming out here too. To witness the demolition zone. And even to stand on the last remaining stumps of the art deco monoliths. Standing in the shattered remains of the art deco pillons. Picture looking up towards the stump of where Whittier Blvd and the Sixth Street Bridge once met. While one of our buddies is standing on the remaining stump of one of the demolished pillars. And as I sit on my piece of broken bridge in the midst of all this, watching people frolic, I can’t help but be reminded of similar stories I often heard from my elders from their youth. Of when the freeways came demolishing their way through the neighborhood of Boyle Heights, when they were kids in the late-1940s and through the early-1950s. And I remember their memories they have shared about demolition zones and the roads which were closed to traffic, and of how they often became vast playgrounds for many local kids. Coming out to play make-believe on top of the sleeping tractors, and to run and play tag in what would eventually become the middle of the freeways. Like I said, I have often heard these stories from my elders. Though I never thought I would experience anything quite like it in my days. We awoke to the next day, hung-over in our bitterness from the events of the night before. The morning was met with gloom, yet the breaking day felt harsh. Like someone had turned the white way up on a TV screen. 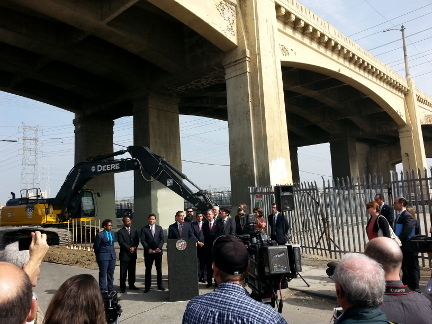 Nonetheless, we got our asses up to make our way back to the site of the Sixth Street Bridge. We had lost our chance to return to the bridge that last night because of the disruption and the resulting police sweep. Though there was the promise of a final walk with our city council member planned for the morning. As we made our way off the block and on to Whittier Blvd, the reality of how complex this day was going to be really set in. The morning traffic we immediately noticeable. Traffic stayed pretty much stalled as far back as Euclid. We rushed as we walked passed the frustrated commuters heading west towards downtown. 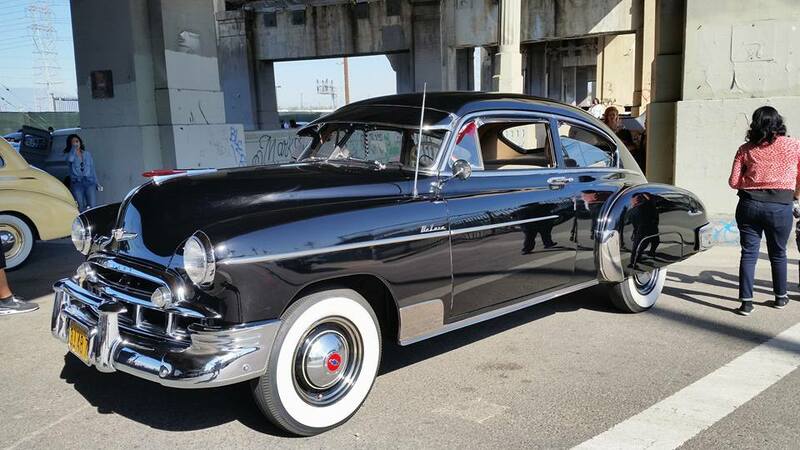 It seemed that we made down the boulevard by foot faster than the people in their cars. I was expecting this. All this traffic. And was the city, because they called in traffic guards to direct the traffic at Boyle Ave. Diverting traffic that would usually pass over the Sixth Street Bridge to the other adjacent viaducts, the Seventh Street and the Fourth Street viaducts. What I wasn’t necessarily expecting was to see the pedestrian senior citizens staring westward. 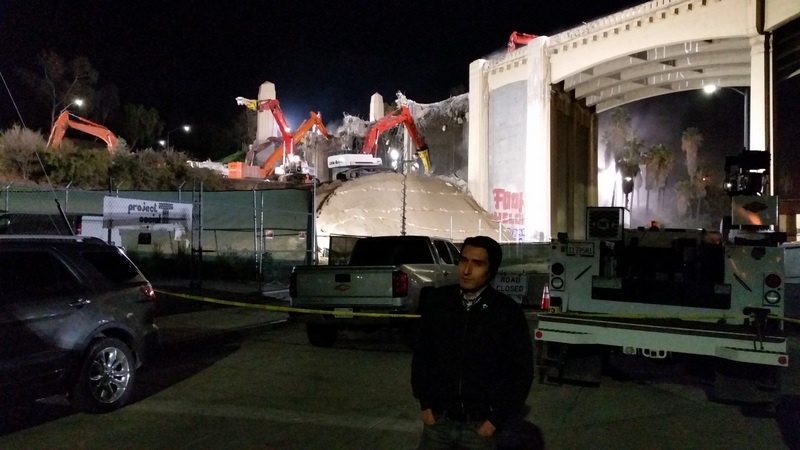 Staring at the newly erected concrete barriers and chain link fences, placed just before the art deco pillars of the bridge entrance and the on-ramp to the 101-freeway’s northbound entrance. I don’t know why it hadn’t really occurred to me that the final walk on the Sixth Street Bridge would be only be allowed from the Art’s District end. 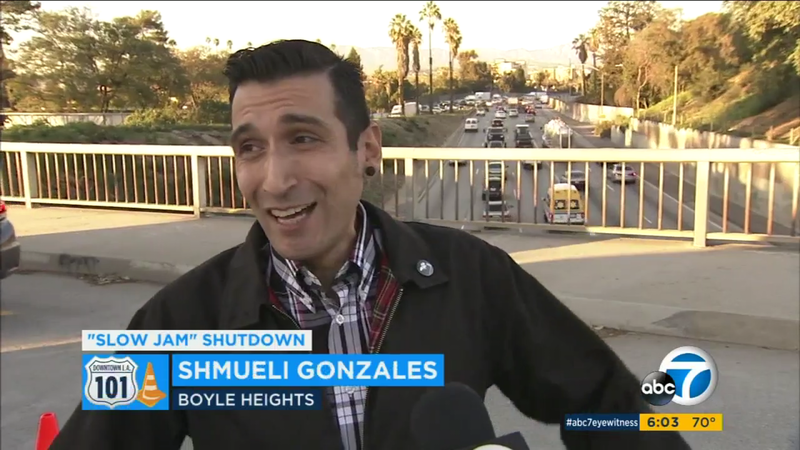 Though when I saw the awe and confusion on the faces of elders here on the Boyle Heights end, that really captured my attention and concern. And I really forgot about everything else. I just wanted to be there with my people as they expressed both their awe and their disappointment. So for a while I stood around talking to the other residents. Some just stared towards the barriers. Others stood about complaining about a community that was changing far quicker than any of them had ever imagined. And as we lingered there the corner of Whittier and Boyle seemed to attract even more people to the site like the aftermath of some calamity. And that’s exactly how it felt at this intersection, In the shadow the charred debris of the laundromat and Domino’s pizza. An older lady sat at a bus stop for which a bus would never come. And the old guys chatted amongst each other and shook their heads in disappointment. Emotions had already been high at this corner ever since the strip-mall went up in flames. Destroying the corner laundromat and a Domino’s Pizza location. The corner of Whittier Blvd and Boyle was already torn-up like an open wound, after a fire ripped through the strip-mall just a few weeks before the bridge closure. Given the long history of property investors wanting to redevelop this corner and the fact that this fire happened just coincidently right before the bridge was closed for years. These businesses had promised to stay open through the construction, even though many wondered how this was sustainable considering that they would be loosing vital traffic for years. Then this happened less than three weeks before the bridge closure. So hanging in the air there were wild rumors of transa; conspiracy. Some throughly convinced the businesses were torched for insurance money, while others insisted it was to make a clean slate for development around the area of new bridge project. I just listened as people as they let out their fears and anxieties, over what was happening to a town which had been pretty much unchanged for so long. “You know, they have been trying to develop that corner with condos for years,” one of the older men tells me. Explaining that ever since the late 1970s developers hoped to take advantage of various propositions and ballot initiatives in order to change that whole side of the street, Starting with eliminating that retail strip. He wondered if this would now open the way for huge housing changes at this corner, at the entrance to the new Sixth Street bridge. Now this corner was as ripped-up as an open wound. It’s hard to just dismiss the panic and confusion about. And the bitterness. The television news media had set up in the middle of the street and began reporting. The locals tried to get me to talk to the media. Which I had lost patience with, as they mostly wanted to just talk about the sense of excitement over a new bridge that wasn’t widely felt here among us here. At one point I actually had a cold interview with the Univision reporter. When I began to speak about how the eastside was still being neglected in the plans for cultural and artistic redevelopment features in this new project. She insisted such features would certainly be included. I asked her to cite her sources and point in the plans to plan where these items were being represented. She said that she had heard and “just knew it was going to be done,” then ended the interview abruptly with a bitter face. From that point on, I had enough of the media for the day. And for that reason did everything to avoid them as I continued to linger about the viaduct. As everyone else made their way to work or back to their homes, I continued to explore. And eventually made my way over to the westside of the river, and over into the downtown Arts District. The barriers were just as imposing on the western side of the bridge. And their presence was just as stark. Just as shocking to behold at first. I was glad to at least run into some of our homeless friends, people we have met who have lived on and around the bridge for years. We have been really worried about what is going to happen to them. As I made my way around the underside of the bridge I happened to stumble upon a press conference with the city and project officials, which was closed to the public. Just then someone had motioned for me to follow her in, wanting to help me pass myself off as part of the junket. Though I resisted the urge, knowing I was the last guy these suits wanted in there for their exciting milestone media spread (especially after my last appearance at their press conference). As you see in the video, I ended up talking to one of the photographers as I made my way over to the riverbed. Notice the conversation we had. Why does the eastside need anything additional planned for our side? Why is the development in the Arts District not enough and why can’t we just go there instead? So I do find that I have to make the case that we have our own cultural identity and local heritage. Though when I point to how many of the plans for redevelopment and in the end never fully follow through. Leaving whole areas in blight. Now that he could agree with, you could hear him reply in the background, as we parted ways. As the press conference dispersed, I found that a few of the artistic and cultural community liaisons connected to city hall were out and about to capture some pictures on the riverbed. So interestingly, after grabbing their attention I spent the rest of the afternoon and into the evening trying to push the idea of a Boyle Heights heritage and cultural arts corridor to these very establishment people, who just didn’t know what the facts and sentiments were of the everyday people in the barrio. There are certain days which come with excitement, and some approach with dread. And this day came with a great sense of both. Long had we been awaiting the final closure of traffic to the historic Sixth Street Bridge, and these were our few and precious final hours. When I arrived at the viaduct the morning was already turning to bright noon. Without a hint of winter, the sun as strong and warm as a summer day. The bridge was already starting to buzz with photographers and news media. And people walking back and forth in order to capture a few final memories and connect with history. Many people coming out to pay their respects to this glorious landmark. As we were standing there just communing with the bridge we were cheerfully approached by Merrill Butler III and his wife, he is the grandson of the designer and builder of the viaducts; including this very bridge here. Merrill and his lovely wife spent a great deal of time hanging out on the bridge with us, and sharing their family stories regarding this place. It was a rare moment to receive and share some deep personal history. We also got to toss around ideas on how to preserve the history of this place. One of his finest ideas on how to maintain our connection to the old bridge we all love so much, was when he personally suggested to the city planners that they preserve one of the original metal arches and some of the decorative light posts from the classic Sixth Street Bridge. For setting down in the area of a future park below the future bridge. As we spoke you could actually see work crews all around us painting primer on the items which were being selected for later removal. For which he also noted that the two bridge dedication plaques had already been removed. The eastside plaque being stolen by vandals. Something which stings for Merrill, as his grandfather’s name was honored on that piece of the old landmark. While luckily the westside plaque was then removed for safe keeping, and is now kept in storage for future display. He also carefully listened to my concerns about how the vicinity of the bridge corridor in Boyle Heights is being carved apart for the new viaduct project, while in the end getting really none of the programmable cultural and artistic space which they had promised for both sides of the bridge, and thus far only delivering on the newly gentrified Art’s District side of this bridge project. And he offered us some great ideas for future programmable space, while making inspiring use of historically reclaimed materials as he does. And how to possibly attract interest in historic and cultural preservation here. To say the least, the meeting was something which awed me both as local geek and as a historian! And also gave me a lot to think about, as I face these tides of community change and try to secure the best outcome for our homegrown eastsiders. Now in the span of our hanging out the steady increase in the number of sightseers and brought out an unusually tense presence of the LAPD. Which at one point started to get all snappy with our crew for no reason, for which Merrill asked the cops to take it easy and leave us be because we were cool, before departing himself. Though as the crowd grew it became clear that the police, which normally ignored this area and shirk at patrolling the top of this bridge, were today going to be relentless. As their sense of cautiousness became soured by their bitter resentment of being tasked with maintain order here. Sadly, the repeating theme of the day was that of the police making a huge scene all for one person. No doubt there was a party-like atmosphere to the entire afternoon and evening. And there most certainly was an ecstatic sense of festivity and also chaos. As a mass of locals and tourists descended on the entire viaduct. The bridge became covered with a steady stream of car cruising and pedestrians. Taggers and photographers. Cars racing and spinning in the riverbed. The sky overhead constantly buzzing with helicopters. And in these final evening rays spent at this most important spot to us, everything seemed to culminate into one overwhelming sense of how special this moment was. And also triggering this cruel sense of imminent loss and gnawing uncertainty for the future. As the day turned to night, we continued to congregate. With each minute the excitement rising. So how did it end? How did we end our final night on the bridge? After all these years of dedication to maintaining our spot on the bridge and also being the fiercest demonstrators for the historical preservation of the viaduct, people wondered how we would walk away from this. I certainly know that most people expected me to chain myself to the bridge, refusing to leave. In reality we ended up leaving the bridge just an hour and a half before the police sweep, of our own accord. With crowds of people swarming in from both east and west, the atmosphere quickly became unruly. Sometime after sunset my parka jacket had caught on fire, a casualty of the ruckus of people and fire-spinning (don’t worry Chris, I patched it up buddy!). And still it seemed like nothing would put a damper on our closing night celebrations. So it was a total shocker to me when in the middle of me doing some broadcast interviews, my friends picked-up from our spot and started walking back home towards the eastside. Startled to see them go, I quickly broke away and followed after them in concern. When I caught up with them they explained that some westside hipsters started getting aggressive, with some outside revelers wanting to pick fights with them. Instead of resorting to violence, they had decided to leave. So it was decided to regroup and grab more beer, and come back. Though I was very reluctant to leave, I wanted us to be together for this last night. I began leaving the bridge while vowing to return when things had slowed down a bit. Wanting to have a more intimate farewell. Though it was clear to everyone that I was nervous this might actually be my last chance on the bridge. 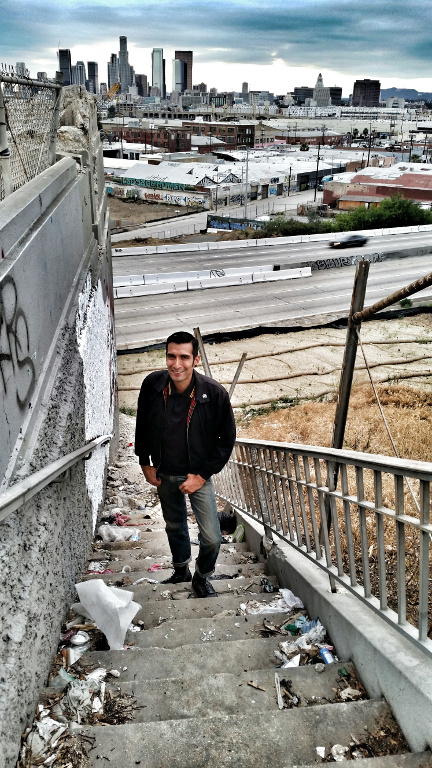 As we walked back towards Boyle Heights, there was a sense of numb shock that came over me. And a painful grating felt inside caused by the rising sounds of both tense crowds and swarming police which rose from all round the viaduct. And then for moment I stopped and took a moment to step back a few steps, and like Lot’s wife I looked back and stood their just paralyzed in my desperate attempt to take it all in one more time. These are the final image taken from the bridge. One of my final moment of awe being captured by Zero. And the other, my last photo taken from the entrance of the bridge. Zero ccaptured this photo of me looking back in awe, one last time. This is my finial photo taken from the bridge, before its closure. As we walked back home via Whittier Blvd my agitation grew, as something was very wrong at the bridge. I had never seen anything like it. And a few times I stopped and contemplated going back immediately. Though by the time we arrived at the house, it was already all over the TV news. And people were messaging me to make sure that I was safe. Because something was already going down at the bridge. It turned out that the crowds were stopping traffic on the bridge near the eastern set of the arches. The crowd was being asked to disperse by a police officer. At some point one police officer inexplicably grabs for the skateboard of a girl named Lydia. She grabs her skateboard and pulls it back to keep hold of it, with the officer lunging to grab it from her. She began to resist, and was taken down to the grown and arrested. All of which resulted in the crowd crying foul over this and groaning. It was reported that the LAPD police officer felt threatened by the crowd and called for back-up. The backup arrive with the police coming in shoulder to shoulder, and both from the top and streets under the bridge, my local friends who did linger were dispersed by police holding the position of a skirmish line; brandishing batons and rifles. 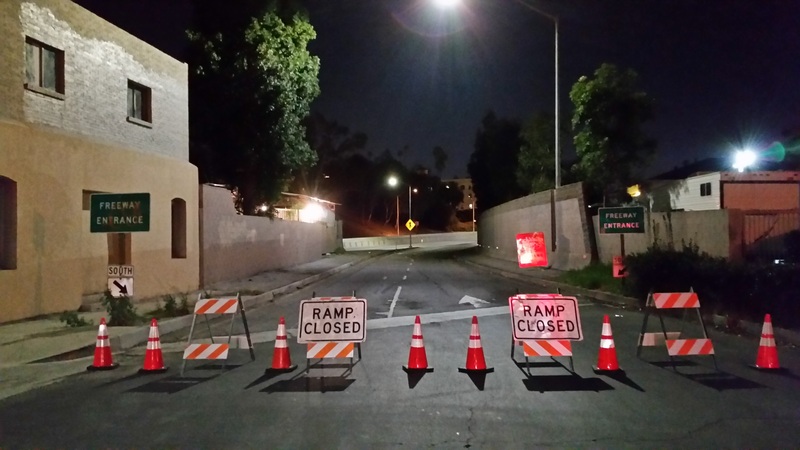 The bridge was thus officially closed to all traffic at around 9pm on January 26th, 2016 by police in riot formation. So I never did make it back to the top of the bridge to actually pay my final respects; something which left many unresolved feelings for me.